A glueless floating hardwood engineered flooring lets a DIY-er handle a flooring project more easily. The lack of glue means you can work faster and maintain better air quality in the process. The cost of this kind of floor is often more palatable than other hardwood floors. Unless you are lucky enough to have an unending budget for renovations to your existing home or building a new home, you have a budget that you have to stick to. That is why you must try to use your money wisely to ensure that you can get the look that you want and need for your rooms or home. The floors make up a major area of a home and finding flooring that is both beautiful and budget friendly is essential to making your home warm and comfortable for you and your family. The glueless floating hardwood engineered flooring can be an option that will help you meet both your financial and aesthetic goals. What is so great about glueless floating hardwood engineered flooring? One of the best things about the glueless floating hardwood engineered flooring is that it can easily be installed by the homeowner. Due to the floating design, it can be simply installed over existing flooring, as long as the floors are not uneven. They click and lock together without any glue or nails to make installing the floors very quick and easy. In just a few hours, you can change the entire look and feel of a room. Another benefit of the glueless floating hardwood engineered flooring is that it gives you the same look as hardwood without the price. Engineered flooring is constructed of a layer of hardwood that is made extremely durable due to the underlying plywood layers that make up the core of the flooring. The top layers are available in a wide variety of wood species to allow you to choose the wood variety that you want. The top layer of the glueless floating hardwood engineered flooring is prefinished to allow you to simply install your floors and use them without the added stress of having to sand and finish them. Due to the real wood top layer, it can be sanded and refinished if needed to give your floors a new look. This is something that must be done very carefully to ensure that you do not gouge into the plywood layers. 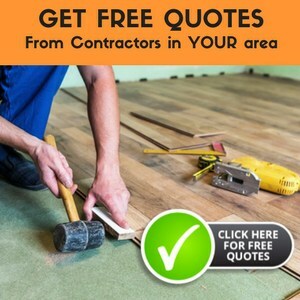 Most engineered flooring can be sanded one to three times, depending upon the floors, but it is important to ask your flooring professional about refinishing your engineered floors before purchasing your engineered flooring product or beginning the refinishing process. Due to the layered construction of the glueless floating hardwood engineered flooring, it is ideal for use in any room in your home. From basements to bathrooms to kitchens, even moisture-prone rooms can have the look of wood. The layering effect of the engineered flooring can expand and contract without buckling or rippling, unlike hardwood, which makes it great for any room. This durability and function make it a favorite for homes of all different types and sizes. Glueless floating hardwood engineered flooring can give a room or home a warm and updated look. No matter what room it is in or what your budget is, this engineered flooring can be just the right choice to make in order to make your design work for you.